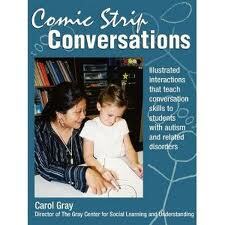 Comic Strip Conversations: Illustrated Interactions that Teach Conversation Skills to Students with Autism and Related Disorders by Carol Gray. This is a book of comic strip conversations that illustrate ongoing communication and provides additional support to individuals who struggle to comprehend the quick exchange of information that occurs in a conversation. These strips identify what people say and do, and emphasize what people may be thinking. Pp. 37.